THE THING cast and crew screening was held thirty years ago tonight on the evening of June 11, 1982. We had some trouble finalising the date. Universal's largest showcase, the Alfred Hitchcock Theatre, was then in nightly use trying to accommodate the turn away throngs of invited guests to E.T. THE EXTRATERRESTRIAL ( which also opened theatrically this night amid reports of record-breaking box office ), but for one evening they agreed to relinquish their hold and moved to three smaller screening rooms nearby ( the same rooms where we had tested the alternate ending for THE THING several weeks earlier ). 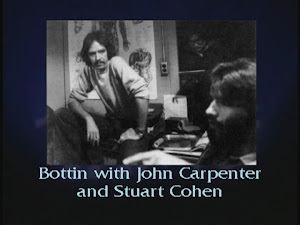 The most enthusiastic response to the film that night came from the loyalists - Rob Bottin's gang loved it, as well they should, and thought it fairly represented the year of punishing work they had put into it. They were the rock stars of the evening, the execution of the effects universally praised by everyone. Ditto, acclaim for the sound effects team and their impeccable performance. 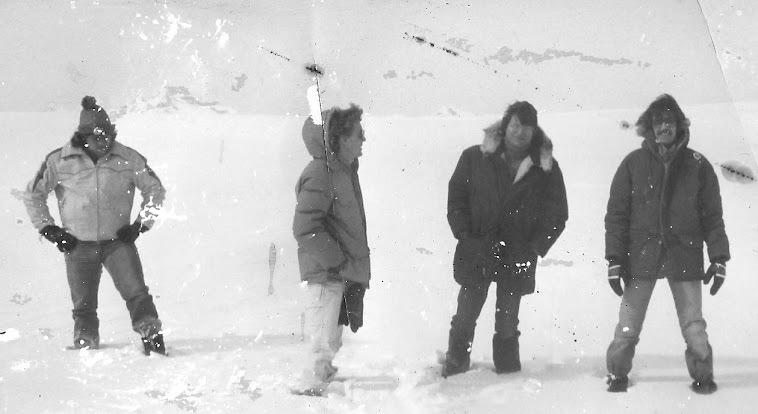 Kurt Russell had seen THE THING several weeks earlier. I was the first person he spoke to when he left the screening ( John was in Tennessee ). His initial reaction was not positive, believing that much of the hard work, the relationship work done by the actors from rehearsal on was left on the cutting room floor in favor of what he called the "ick" factor. I think it is fair to say that most of the cast who saw the film this night felt the same way. There was general agreement that Rob's work was superb but maybe too good in that it overwhelmed the film and reduced them all to "pawns" as one put it ( I think thirty years intervening time has notably changed and softened their view as it has at the same time increasingly validated John's decision-making ). The reaction among friends was more positive, but scarcely the ringing endorsement we had hoped for. Most thought the film powerful, but at the same time too dark and depressing - as one put it, John "had taken things one step too far". Several said the THE THING was unpleasant to sit through, something to be endured rather than watched, not words one cares to hear describe the film two weeks before release. But the dominant storyline of the night was typified by the reaction of a close professional colleague, a producer of note, who came up to me with a "what can you do" expression on his face, shrugged with his palms up and said " Well, it isn't E.T." thank you so much for all of the info you've shared on the Blog so far. I had held out hope we'd see a big update/post on the release date anniversary (June 25th?) and have been checking every day. I realize you've covered most all of it but can we expect any more? 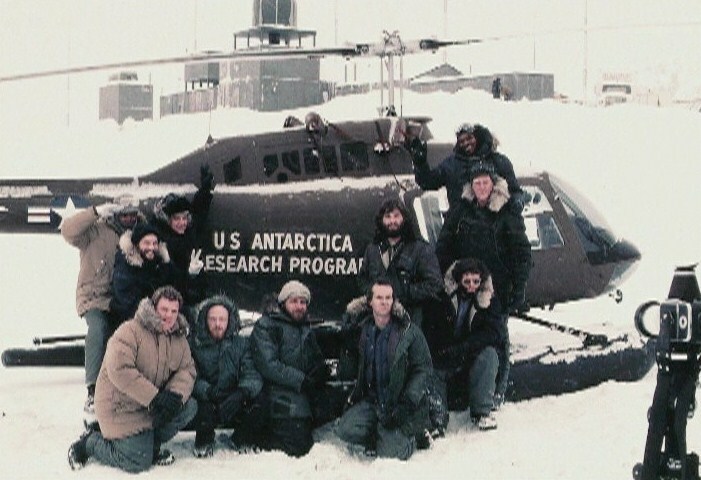 I've heard John Carpenter say in many interviews that everyone hated THE THING on release, not just the critics but the horror fans as well. After reading your posts here it seems that this is what you ran into as well, but I need you to know that not ALL of us horror fans took 20 years to appreciate you and your teams work. 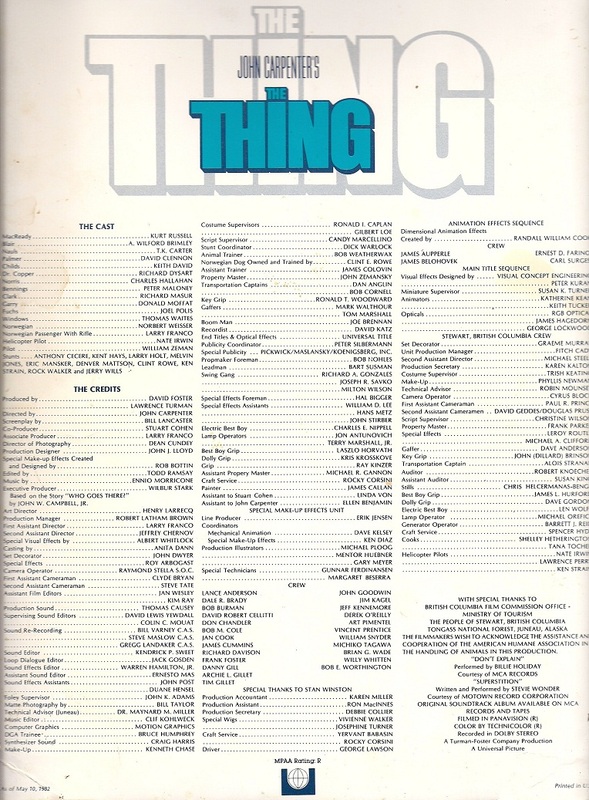 I was only 12, almost 13, when I first saw it but I loved it right away, immediately singing it's praises to my friends, buying the one-sheet, buying the soundtrack. Later I had a special video party to show my friends who couldn't talk their folks into taking them to see it in the theater. 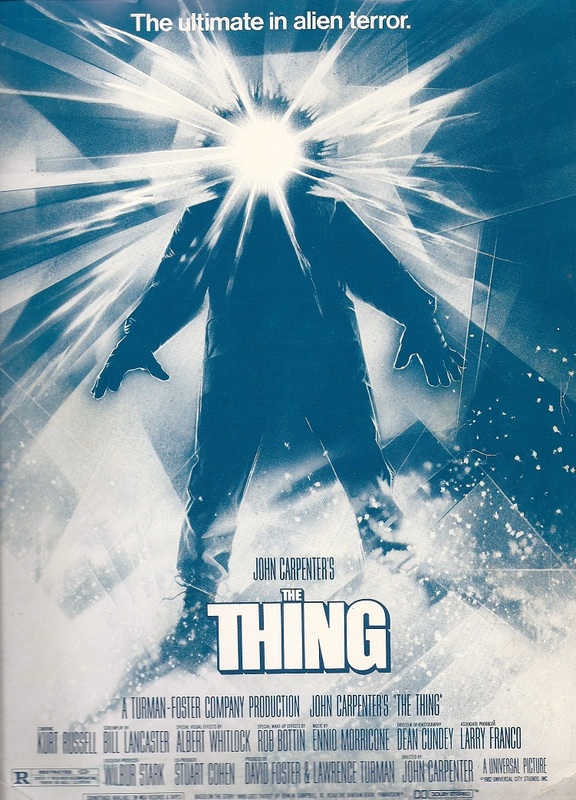 ALIEN had made me fall in love with horror movies, but I thought, and still think, THE THING had outdone it to take the title of greatest monster movie ever made. Sorry it has taken this long for you to hear this from the fans, but thank you sir. Thank you for picking up the torch for this project and running with it through completion. You all did a fantastic job. I have a friend who has licensed and printed anniversary one-sheets for the original STAR WARS films, THE DAY THE EARTH STOOD STILL, ALIEN, IT'S A WONDERFUL LIFE and a few Disney titles. 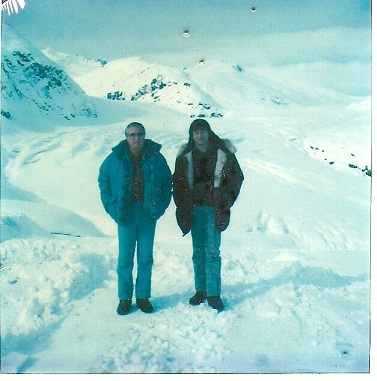 We had discussed looking into the rights to do a THING 20th Anniversary poster and I brought up the image/photo of the dark man in the snowsuit with glowing face and hands, but we couldn't find anybody who could provide a transparency of the image. Do you have any idea if they actually printed any posters of this image? Any idea who might have this source image to do a new poster? Thanks again for sharing all you have so far. I'm trying to spread the word. No, the artwork I speak of in my piece is represented by the unused poster in B and W I feature. We never considered anything like a figure with the face blacked out. I really think Drew came up with the original idea on his own, and the artwork for the novelisation was drawn from that idea ( I am unclear whether this is a first edition or not ). BeAst WisheS - The Faithful Fan.